All available police positions and the applications are posted on the Employment page of this website. Westminster Police Department appreciates your interest in employment opportunities with this agency. 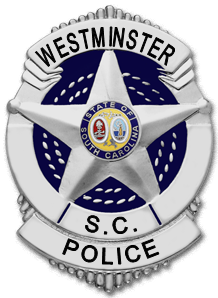 We are extremely proud of the professionalism of our Westminster Police Department. The Department is committed to the philosophy of Community Oriented Policing and all employees are expected to be responsive to our community in the delivery of quality services. Recognizing our responsibility to maintain order, while affording dignity and respect to every individual, our objective is to improve the quality of life through a community partnership that promotes safe, secure neighborhoods. The following information is provided to answer your questions on employment with this Department. The Westminster Police Department looks for the highest quality applicants when filling open positions. Must have or be able to obtain a SC drivers license class D.
Paid training time and court even when normally scheduled "off-duty"